The Low-lying country of lower Slovak river Vah, from the west bordered by Low Carpathian mountains and from the south bordered by river Danube, belongs to the most populated part of Slovakia. From a geographical point of view occupied the foremost place between trade routes, which passed through this area during the primeval age and middle ages. Like in the neighboring Moravia, where we have material proof of ancient hunters and gatherers from older period of the Stone Age in the form of habitations and tombs, in river basin of Vah we also find habitations from this period. These findings predate further development, which continued into younger period of Stone Age which was represented by denser habitation of first agricultural communities (5 000 B.C.). In June and July of 2000, the Museum of Western Slovakia in Trnava conducted research on a part of such habitat from the period of younger Neolithic Period (in the span of 3 800 to 3 300 B.C. ), which is the final period of younger Stone Age. On locale Hlohovec, part Panska Niva, in the proximity of river Vah on the gentle slope of southern projection of mountains Povazsky Inovec, were found ceramic vessels, stone and bone tools of Lengyel Culture (named after eponym locale in Hungarian, note), which was in the Neolith and eneolith spread on wide area of midstream of river Danube in Hungary, Slovakia, Lower Austria, Moravia and later in Czech land. Ceramic: Ceramic vessels in this culture attract foremost by their painted designs, which were distributed not just from outer side, but also from the inner side of vessels. Dominating was use of red in combination with yellow and white paint. Painted was practically whole assortment of containers, but mostly ceramic with thin walls. Partially were also used engraved ornaments on surface. Biggest group of finds from research was represented by fragments of bowls with hollow legs, thin walled chalices, low shallow bowls with protrusions and massive pots with handles in variety of shapes. All objects were in fragments and into the ground were put only after debasement, when they stop serving its original purpose. 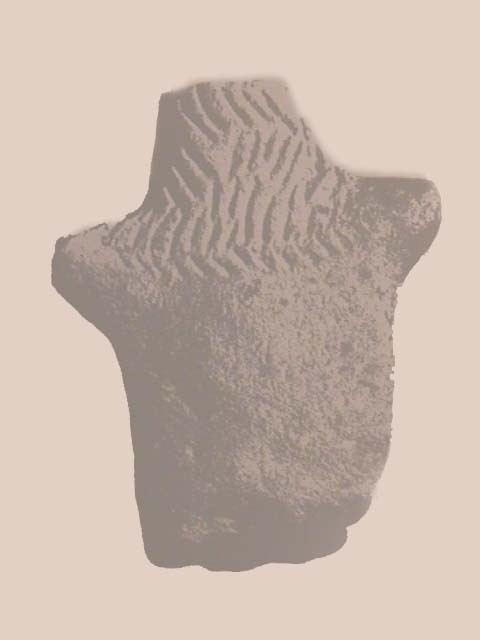 As a significant find may be considered clay fragment of female plastic - Venus with engraved ornament on the neck. Stone:Stone tools from locale were divided into two groups. First and most numerous groups was group of chipped stone tools. Tools were fashioned from big kernels into the shape of blades and scrapers. As a raw material were used different types of flint and volcanic glass. Last named material, volcanic glass - obsidian, was imported from area some 300 kilometers away from eastern Slovakia and northern Hungaria. Second group was represented by cut stone tools. Even before start of research on the surface were found stone axes and drilled axe-hammers, but also half made unfinished products. These tools were made mostly from the slate. During the research were found only several fragments of these tools, and actually some had marks of usage even when they were already broken and unsuitable for chopping. Last group encompassed different grinding stones, some kind of ancient mills for grinding of grains and other crops. There was large number of these in this settlement, which is a testimony about their frequent use. These stones must have been indispensable part of work of ancient farmers, who were to large extent dependent on harvest from cultivation of the land. Bone and antler:bones and antlers from tall animals were found on locale in both fashioned and raw form. Amongst bone tools dominated needles and picks, to lesser extend small chisels, probably for preparation of fur, respectively fabrics. Cone-shaped bob from the weaving loom is documenting production of weaved fabrics. Antlers by and large weren't modified, because they already had pointed shape, and so were fulfilling same function as other fashioned bone instruments. Settlement:During the rescue archeological research in Hlohovec part of Panska Niva were found mining pits (dug for the purpose of obtaining clay for the purpose of covering walls of houses) filled with the objects from ceramic, stone and bone. In their vicinity were found negatives of post's holes, in which were once planted stakes from construction of big hall-like houses. In the settlements from this period is this type of big hall house common and is bearing witness to big family units of Neolithic population. In the big part of researched settlements in Lengyel culture are also found individual burials in between occupied structures and exception aren't even freely thrown around parts of human bodies, like skull without body or individual bones. These finds are possibly attesting about till now unresearched practices of that population with non-honorable manipulation with deceased. During the research in Hlohovec was found in shallow grave skeleton of immature individual without of gift objects, put in crouched position on the right side with hands on front of the face. Orientation of the skeleton was in the direction east - west. This grave thou was probably in medieval times not covered with soil thoroughly, because part of the leg and hip bone were dragged to surrounding areas, which can be attributed to beast of pray, looking for food in the settlement. The research in Hlohovec is significantly supplementing previous research on settlements of Lengyel culture from Slovakia and surrounding countries. Topology of finds is placing settlement in Hlohovec rather on the very beginning of this culture, when were just forming lengyels settlements on Middle Danube. Similar finds were discovered during research on locale Svodin (county Nove Zamky) and Ruzindol - Borova (county Trnava).